Physically protected bikeways have been implemented with great success in cities like New York, Chicago, and Washington, DC. But in California, where such facilities are still considered “experimental” by Caltrans, outdated state standards make it difficult for transportation planners to implement them. That could change under a state bill called AB 819, which would give California cities more flexibility to implement bikeway designs that are fast becoming the best practices in leading American cities. “The goal of AB 819 is to free up communities to implement the kind of innovative facilities we’re seeing in use in other parts of the country and in Europe,” said Jim Brown, communications director for the California Bicycle Coalition. Under current state law, facilities like protected bike lanes and bike boxes — which are not established within Caltrans guidelines — must go through an expensive and time-consuming approval process. Although some have been built in cities like San Francisco and Long Beach, they haven’t come easily. AB 819 would allow planners to use guidelines that have already been developed outside the state, like the Urban Bikeway Design Guide, released last spring by the National Association of City Transportation Officials (NACTO) and approved by U.S. Transportation Secretary Ray LaHood, to help them plan and fund those projects. But the bill’s reach could be limited by an amendment proposed by the California Association of Bicycle Organizations (CABO), a smaller coalition which argues that using outside guidelines for bikeways could be problematic. Their alternative proposal, which will be considered at a State Assembly Transportation Committee hearing on Monday, would only allow new types of bike facilities to be established under an experimentation process within Caltrans. A reliance on outside standards, Baross argued, could lead planners to build facilities that are inconsistent and don’t necessarily translate from other states. As an example, he pointed out that drivers in Oregon are taught to yield to bicycle riders passing on the right when making a right turn, whereas California drivers are instructed to merge into the bike lane. That, he said, could create problems within bikeway designs imported from Portland. But Brown argued that city planners would still ultimately be responsible for the designs they choose, and repeating the work done by transportation planners in cities like New York would be superfluous. Protected bike lanes have been proven to improve safety for all street users, and they’ve been credited with significant gains in bicycling rates, as more people become comfortable cycling on the street. 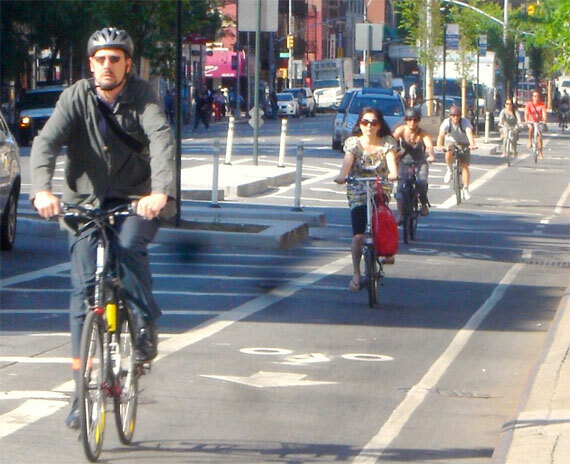 Roughly twenty miles of on-street protected bike lanes have been implemented in New York in recent years. Traffic injuries have fallen by as much as 35 percent on some routes, and bike counts have soared since the city started using the new designs. Great article and great news! Please keep following this. What a ludicrous amount of regulation. Lets leave the street design to the street designers. Let’s pass AB 819 so each city may determine how they will design their bike routes. If we are to begin the process to challenge the red tape, January of 2012 is a great place to begin. Then let’s see how far we reach and stretch our imagination of what our city would look like with bike lanes. I’d support this bill, but only if it also repealed section 21208 of the Vehicle Code, so bicyclists won’t be required to use the defective, dangerous, and unsafe facilities that will be constructed. Street design is called traffic engineering, and the people who are qualified to do it are called traffic engineers. The current Caltrans process, and the accelerated process proposed by CABO, is based on engineering standards. NACTO’s agenda is driven by politicians, landscape architects, urban planners, and activists with a multitude of interests, only rarely employing engineering methods. That’s why NACTO’s designs are popular but unsafe. I agree, leave traffic engineering to the traffic engineers. Let’s get innovative street design and operation that works for bicycling, walking, and motoring implemented Statewide – and nationally. That’s what CABO has recommended the legislation require Caltrans to do; establish a system for upgrading the State’s requirements for Bikeways and roadways. Roads are for people not only for people in cars! I’d support this bill, but only if it also repealed section 21208 of the Vehicle Code, so bicyclists won ‘t be required to use the defective, dangerous, and unsafe facilities that will be constructed. This sounds harsh but it is important that people who are really commuting can do it the safest way without dangerous path ends and junctions.. Let the bicyclists have a chance to give good advice to those who will be constructing and make roads safer for all. Only when a path goes more directly than a road and doesn’t have intersections would it be my choice. More sidewalks are fine, just repeal all restrictions (21202 and 21208) so people who have learned how to operate their bicycles according to the rules of the road can do so in the road without being bothered by brother bob in the squad car giving them pointers on how and where to ride. Also, if the reason we require motorcycle drivers to wear helmets is to reduce state health costs, maybe we should require cycle path riders to wear kevlar crash suits. Just thinking ahead. A street designer and a traffic engineer are not one in the same. I have worked with traffic engineers for many years – and came close to becoming one – and I value the service they provide (when not obstructionist old goats who still reference sidewalk studies from the 1980’s when discussing innovative new bike facilities). But being a successful street designer requires a very thorough understanding of not just traffic, but land use, urban design, and the policy implications related to climate change and social justice. Traffic engineering is not rocket science – it’s not something only experts in a laboratory understand. We left road design to traffic engineers for 50 years, and it left us with a destructive mess that my generation and my children’s generation will spend much of their lives retrofitting and rebuilding for a more sustainable future. It’s sad really, all this bicyclist infighting. We need innovative bicycle treatments, sidepaths, cycletracks, sharrows, education and encouragement – all of it – not the false choice of vehicular vs. unsafe sidewalk riding. This article contains one error: bicycle traffic signals are already legal for use in California, and have been for over ten years and are in the California MUTCD, (section 4D.104) . They are not however, in the federal MUTCD. Thank the City of Davis for doing the experimentation and evaulation report over ten years ago. They never applied to the FHWA just the CTCDC, so didnt get in the federal manual. should be filtered through sound engineering judgment. bicycling by building segregated, protected, delineated space for bicycling. The barriers to operating a bicycle safely in mixed traffic flow in U.S.
who learn how to do so. include segregated facilities, many of them, all over the place. track; traffic engineers are capable of figuring that out. can make our communities safer. AB 819 is a small step in that direction which is why we (the CBC) are sponsoring the bill. Stay tuned to hear our plans to take some bigger steps. Does the John Forrester crowd get the fact that there are more professional bicyclists (per capita) from countries that have these kinds of facilities than there are from those that do not? How many kids today decide to take up Track & Field or Cross-Country because it is just too dangerous for them to even begin to learn the skills needed to ride a bike over long distances in order to ever have hopes of being a champion? Finally. The possibility for safe, dedicated bicycle infrastructure like in scores and scores of cities around the world. What engineers actually DO with it, is another thing, but this is the way forward if cycling is to return to the mainstream. Sure, the testosterone boys who like to make vroom vroom sounds whilst riding in traffic may not like it, but this is not about them. It’s about liveable cities, the redemocratization of the bicycle as transport and the greater good. Casey, you are absolutely wrong. Traffic engineers do street design too and take all the considerations you mentioned in mind when doing modifications to the traffic operations. Maybe you worked in some odd-ball place or something. Of course, your next statement blaming traffic engineers for creating this “mess” only proves that you are a typical very narrow-minded engineer basher who keeps pushing the US further behind in the world. Everyone who is not a narrow-minded bigot like you (and the bigots who “liked” your comment) knows that this “mess” was created by a variety of forces from politicians, business, and yes, urban planners and the people. Engineers were only the part of the equation that built and managed what the people above wanted. It’s so sad that people like you continue this ridiculous bigotry. The important point that continues to be ignored by Streetsblog and other sites bashing this experimental process is that it is important to see if any of these new traffic devices actually work. I’m sure there are some experiments that did not work and have not been approved. If there is not follow up to see if something is working as intended, it may be too late when someone gets hurt. What we should be doing is expediting the process instead. The Portland example is a great one. If I wasn’t a transportation buff, I would have never known that the laws are different in Oregon than the rest of the country when making a right turn. I still don’t like Oregon’s law that doesn’t allow blocking the bike lane to make a right turn because of the constant right hook threat (especially when on a bike – I kept thinking…does this driver see me or not?). I’m not anti-bike-lane, but I believe it’s better to make wider sidewalks rather than narrower roads. If a line of utility poles is extant , and we can’t afford to move them, or bury the lines underground, wouldn’t it be better to widen the sidewalks? I mean we’d “get more bang for the buck”. I have my own theories about “Vehicular Cycling” . I have built “Human Powered Vehicles”, and recently I started a thread about “Mainstream Human Powered Vehicles” . Some of my Bikes have Fairings, and people think I have a Motorcycle. I have lights on all my bikes, including amber marker lights on the sides (have gone all LED as of NOV 2011) . I’ve put Farm Triangles or “Slow Moving Vehicle” Signs on two of my bikes. Last Friday, I was making a video to show how bad traffic is at a main intersection and two SUV’s collided right in front of my camera (it’s on YouTube). Different people have different levels of strength and fitness. Any Human can put out more power for a short duration than for all-day endurance. A choice between a MUP or the adjacent road? I think that’s what people need- a Choice. I want to see sidewalks on all county roads, and bike lanes on all state roads with a speed limit of fifty per of higher. I am NOT anti-bike-lane. And I want a Bike Box at the intersection where I videotaped the SUV wreck last friday night. That is outdated research. Both numerous Dutch and Danish studies, as well as the data from New York show that bicycle infrastructure makes life safer for cyclists. That the Fahrrad-Club celebrates “an end to most compulsory use of cycle tracks” isn’t to be wondered at, as most bike infrastructure is made for ordinary commuters, not racers. And that is how it should be, really. What the modern cities need is to limit car traffic and get people to ride their bikes. You will never, ever get ordinary plain-clothes helmet-less people to bike among heavy, fast traffic. There’s really no way around it: the Dutch know how to make bike infrastructure, and all the world can learn from them. Intersections is not a problem in Dutch bike infrastructure (and neither is it in Copenhagen ditto). The solution? Bicycle traffic signals. It works. I’m with Joe Linton. We desperately need innovation and more bike facilities. Watering down AB819, so that the process is slower and more careful is ludicrous and completely counterproductive to bicycle improvements. Shame on CABO! Cities that want to innovate and experiment need to be free to try new ideas. Creating a new bureaucratic process to hold up new design to some “safer standard” is a recipe for eliminating innovation. Yeah, they seem to have gotten it more wrong than right in the sticks of Brisbane. On the other hand creating another set of administrators and engineers to convince will slow (or stop) new things like protected lanes in Santa Monica, where I live, there are thousnads of cyclist using the roads. The best thing now is to get the original version passed. And then try to get a more open process for road design. You guys in Brisbane need to be thinking about talking to county sups about bike facilities and the number of voters who cycle – and doing the right thing. Not hobbling the entire state to correct a single instance of poorly designed bike lane.